In a large saucepan, add the sliced onions, Boston Lager, salt, pepper and minced garlic. Sauté until caramelized, approximately 20 to 25 minutes at medium heat, stirring every few minutes. Remove from heat and let cool. In a medium-sized saucepan, combine all mustard ingredients. Warm the mixture on low heat for 5 to 7 minutes. Remove from heat and let cool. Brush the cooking grates clean on your grill. Add two handfuls of the soaked, drained wood chips to the smoker box, or directly over the ashed-over charcoal. Close the lid of the grill. When smoke appears, grill the hot dogs 5 to 7 minutes, making sure to turn them throughout the grilling process. Remove hot dogs from grill and let rest of 3 to 4 minutes. 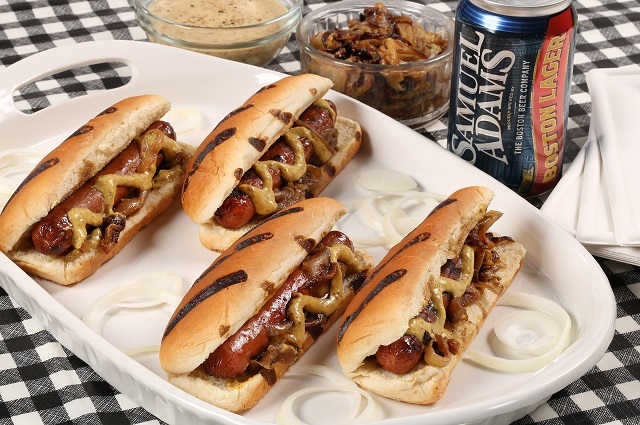 Place a grilled hot dog in each bun with the Boston Lager Mustard and onions. Serve warm and enjoy with a Samuel Adams Boston Lager. Soak wood chips in water for at least 30 minutes. Wet wood will produce more smoke and flavor. Drain wood chips and add to your charcoal grill, smoker or gas grill smoker box. For charcoal grills, position it so that the vent is on the side of the grill opposite the charcoal; this will draw the heat and smoke over the food and out of the vent.